If the dining experience at your home tends to carry over into the living room, think about getting one or two versatile pieces of furniture. A sofa table is easily repositioned to become a server or bar, offering extra surfaces to hold appetizer trays or silverware and drinks. 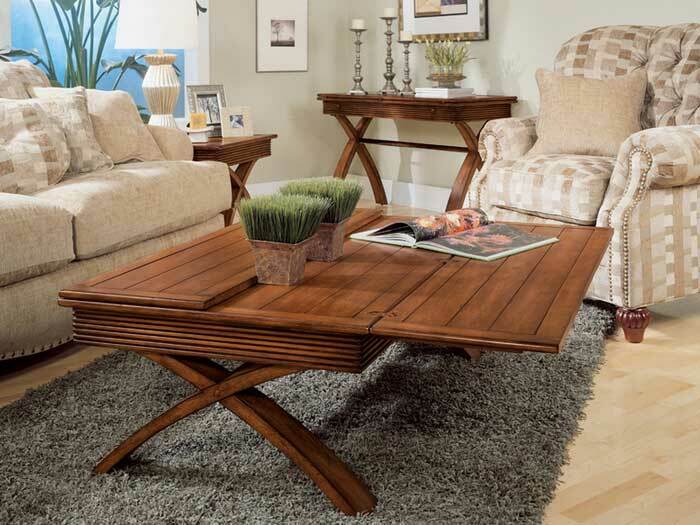 Multifunctional coffee tables with adjustable-height tops provide solutions for entertaining and beyond – tables with lift-tops are very handy for laptop use. For clever casual seating, check out coffee tables configured with stools that can be tucked under the tabletop when not in use. A cocktail ottoman multitasks as a table, a seat, and a footstool, and often offers storage inside. Go bohemian and arrange a few large cushions that encourage guests to get comfy on the floor.